Karl von Frisch would perhaps turn over in his grave at the new technology being perfected at Harvard University. The invention of the Robotic Bee is being programmed to behave as near to an actual bee as possible, except, bee robots can’t dance. Frisch dedicated his whole life to the study of the honey bee, eventually receiving the Nobel Prize for his discoveries which included the miracle of the bee dance. Robo-bees won’t be making any honey apparently either, neither will they be able to sting you, so that’s a plus. What will these robotic bees be doing if not creating your favorite sweetener? Monsanto’s Robotic bees are being programmed to pollinate flowers, live in hives and do a few other ‘not so bee-like’ bee-haviors. The Microbiotic lab at Harvard reports seeing a “host of possible uses for the robotic insects, including military surveillance, search and rescue missions, exploration of hazardous environments, traffic surveillance, and weather and climate mapping.” With these kinds of qualifications, I’m not sure we should actually call them ‘bees’, though ‘bugs’ for sure. Owned by none other than the biotech monster, Monsanto, I am not sure all intentions ought to be trusted. Apparently, these robo-insects will be completely autonomous as well as wireless, weighing less than 10 grams and no bigger than a paperclip. Right now the challenges faced by developers is “colony coordination behavior, working on the brain and the power source.” Making them ‘act like bees’ is not so simple. Researchers received inspired for this project by watching the recent documentary Silence of the Bees, where they were informed about ‘colony collapse disorder’, a phenomenon where worker bees in a colony will suddenly disappear. The movie triggered the thought “‘Hey, wouldn’t it be great if there was some way we could engineer some sort of assistance to this?” Hence project RoboBees began. At least this is the reported story on how it began. With Monsanto involved I am a little suspicious that other thoughts were at work as well. Though new research such as this can be exciting, we better really hope that we don’t actually need the robot bees to pollinate flowers due to honey bee disappearance. Bees pollinate over 90% of fruit and vegetable crops world-wide. Though technology could step into to help and possibly even do a stellar job at replacing lost bees in regards to pollination, we would have more problems than just a lack of honey bees if this were to occur. Not only do bees pollinate the majority of food on this planet, but if they were to all disappear, what would this indicate for humanity? What does their very presence on this planet represent? For one thing, the bee dance is one of the miracles of the ages, and bee robots can’t do it. Since honey bees have been around since the Neolithic age, several million years ago, their disappearance would seem very ill-fated for the rest of us. Even if we could invent a robot that could predict weather changes and pollinate flowers and food, what would that do to the natural order of things? In many cultures, the honey bee represent the Mother goddess, divine feminine, the nurturing force of the universe. The bee maintains ‘the natural order’ and represents the messenger between this world and the ‘other.’ As “organizers of the universe between earth and sky, bees symbolize all vital principles, and embody the soul” according to some sources. 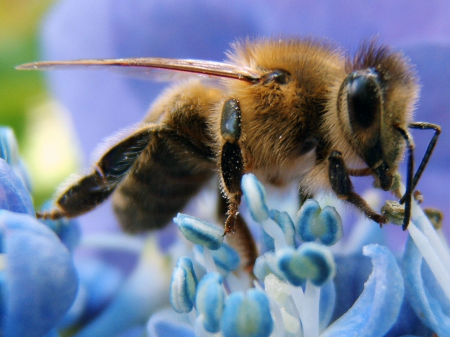 Without bees, we would lack this divine connection in some way, as well as having no more honey – which represent the ‘nectar of life’. I don’t know about you, but no more honey sounds pretty sad. In modern day psychoanalysis it is believed that the honey bee represents the ‘higher self’, the self to which we aspire when transcending all of the ‘lower’, base qualities of mind such as anger, lust, greed and fear. If we were to lose the actual honey bee, could this indicate another ‘fall’ in the human race? Would this loss disconnect us further from who we really are and the gift of re-discovering deeper mysteries? Bee robots aren’t a reality yet, as scientists still have a long way to go in perfecting these tiny pieces of technology. Bee robots can’t dance, and perhaps we would be better off if they didn’t fly either, indicating that our ‘real’ bee population is thriving. As great as science can be, no one can beat Mother Nature and her version of the bee. 12 Responses to "Bee Robots can’t Dance"
Monsanto has absolutely no relationship to this research, which is based at Harvard and supported by the National Science Foundation. 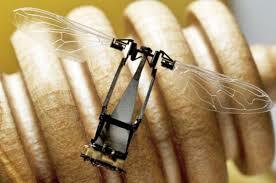 To learn more about these tiny robotic insects and the breakthrough technologies that have enabled their first controlled flight, please visit https://www.seas.harvard.edu/news/2013/05/robotic-insects-make-first-controlled-flight. What is Gene’s problem? “Received inspired” was an obvious writing mistake-deciding between “Received inspiration” and “was inspired”, At the start the author talks in future tense – “being developed”, “being programmed”, “won’t be…”. So, the robots DON’T exist – under development. To my reading, the author does refer to the downfall of civilization with the loss of bees, but they would be a loss to our humanity, and in that I agree. Your impatience and intolerance for this article is needlessly extreme. Did you forget to take your meds today? Okay, if this was written by someone with English as a second language – good effort. But otherwise, how did the researchers “received inspire [. ]” And really, I want to know about the robotic bees. Are they real? The author says that they are wireless and completely autonomous, but at the end says that they need more work to actually work. And in the middle we get snarky putdowns of Monsanto, numerous references to the wonders of the dances of bees with no explanation, some psychoanalytic mumbo-jumbo, and of course some references to pagan gods and other such nonsense. The whole thing hanging onemailing supernatural belief that the existence of robotic bees would necessarily mean the nonexistence of real bees which would necessarily mean the downfall of humanity and civilization as we know it. Seriously? Any event, I guess I’ll look elsewhere for information about the robotic bees. What is this the English Guardian newspaper for the moderately literate?